"Howdy folks! My name is Decker, and I am so grateful that you took the time to read my profile." "I am very sleek and stylish all black male kitty who is looking for a partner in this world. I am a very calm, mellow, guy who really enjoys a good petting session. My felineality is secret admirer; which means that I truly enjoy attention but I also enjoy my solitude. I like to use my alone time to think of ways to show all my love for you! I came here to Wayside when a very loving and caring person found me as a stray. They would have loved to keep me but I am kitty that would be more comfortable in a home without other cats. My time here at Wayside has been wonderful, but I am ready to find a forever home, and I am really hoping that home will be with you! Another interesting fact about me it that I am a FIV positive. FIV is a immunosuppressive disease that is mainly transmitted by deep bite wounds. I am a very cool cat who can live a very long and full life as long as I have a forever friend who looks out for me the way I will always look out for them. Sweet and winsome Decker is available at Allie's Alma Mater, Wayside Waifs! Decker is certainly a friendly guy! What a friendly little sweetheart! We hope Decker gets adopted quickly! Decker should be adopted soon! 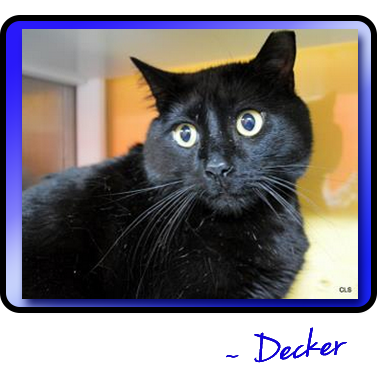 We're hoping that Decker's forever home finds him soon. He looks like such a sweetheart!